In 2009 local photographer and journalist, Jitu Kalita, discovered a dense forest at the centre of Majuli Island’s barren western shores. As Kalita explored the shoreline, he was nearly attacked by a man who had mistaken him for a poacher. After learning that he was a photographer, the man apologized to Kalita explaining his personal investment in the forest—namely, 30-plus years of singlehandedly planting each and every tree in the 1,300 acres of pristine tropic woodland. The man’s name was Jadav Payeng. 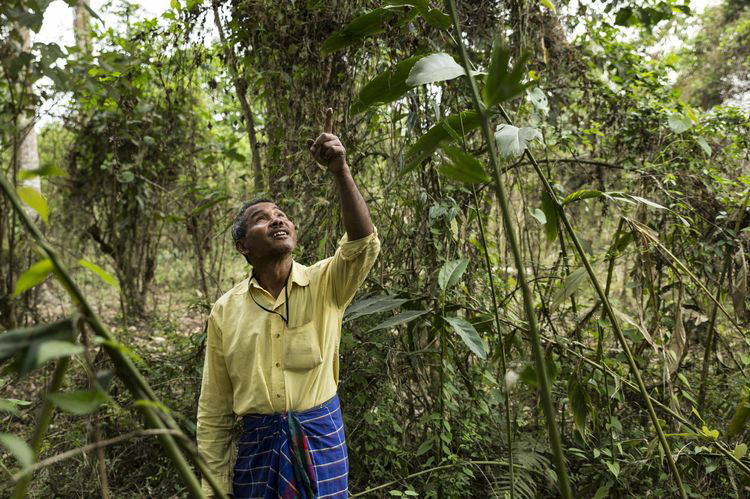 Payeng—who lives in a small hut in a nearby forest with his wife and three kids—began planting the forest in 1979 at the age of 16. Over the years, the North-East Indian forest has become home to 115 elephants, 100 deer, numerous rhinos, Bengal tigers, apes, rabbits and vultures. Majuli Island sits in the body of the Brahmaputra River and is home to about 150,000 people. Every year, monsoon season brings the water level over the walls of the island, eroding the shores and encroaching upon the shrinking landmass. After the flood, the heat dries up the land, making it brittle and susceptible to further erosion—thus the cycle begins again. Since 1917, Majuli Island has shrunk to less than half of its original size. Payeng and local government have tried numerous times to get the forest listed as a UNESCO world heritage site to no avail. Another one of Payeng’s ideas is to combat this process, with help from the Ministry of Agriculture, by planting a surplus of coconut trees, using their sturdy frame to help stabilize soil erosion, while simultaneously stimulating local economy. He claims that there would be tangible benefit within five years of implementing these coconut trees. Payeng has received multiple awards, and in 2012 the Jawaharlal Nehru University vice-chancellor, Sudhir Kumar Sopory, deemed Jadav “Molai” Payeng the “forest man of India,” for his work in forestry restoration. In 2015, Payeng received the highly prestigious civilian award, Padma Shri. Despite recognition, we are yet to see his ideas put into practice—a great source of frustration for Payeng. Surveys predict the island will be completely overcome by water within 20 years. You can learn more about Payeng’s forest in the short film above, documented by William Douglas McMaster.